MIDDLEBURY — It’d be easy to look at the finish of Saturday night’s Northridge Sectional semifinal between Warsaw and Elkhart Central and say that the Blue Blazers’ 4-0 spurt in the final seconds made the difference. 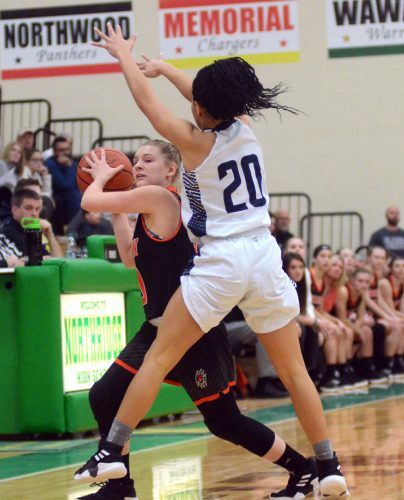 It did in fact represent most of the final margin in the Lady Tigers’ 32-27 loss, but Warsaw coach Lenny Krebs viewed his team’s season-ending defeat differently. “Everybody is going to come back and look at the last couple possessions of that game and talk about the steal at the end and the layup, but the game could’ve been decided before then. We had our opportunities prior to that. We just didn’t take advantage of some opportunities presented to us,” explained Krebs. Whether or not the game was won or lost in the closing seconds, Central sophomore Kaitlyn Costner made some big plays for her team in the home stretch. 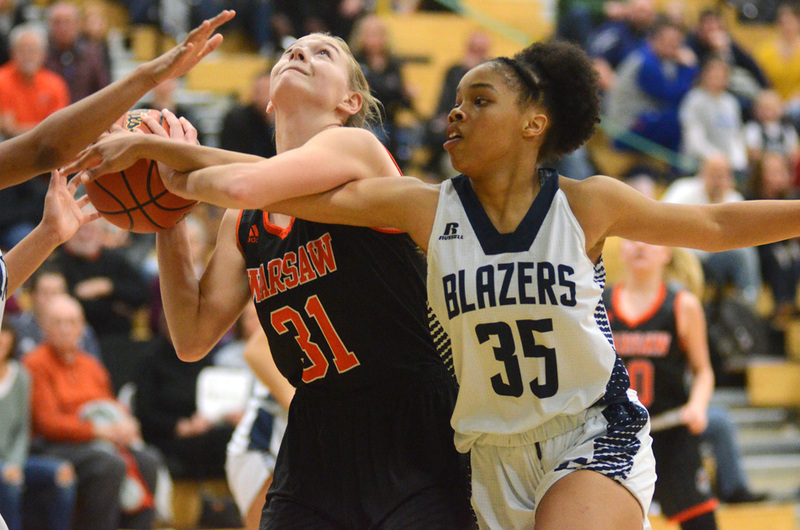 With her team holding onto a tentative, 28-27 lead following a Kensie Ryman triple from the top of the key with 1:42 on the clock, Costner’s one-and-one with 26 ticks remaining gave the Blazers a little breathing room and Warsaw fewer options. Her steal and fast break layup with just 14 seconds to go essentially provided the backbreaker and brought the score to its final margin. Kaitlyn Costner guards Kensie Ryman in the first half. But as Krebs insisted, the Tigers had opportunities long before Costner’s late heroics. Warsaw knocked down just 3-of-14 shots from the floor in the first half. Kacilyn Krebs’ two big 3-pointers in the first quarter helped keep her team in it, but a run of six straight points at the start of the second period gave Central a 14-7 advantage and a lead the Blazers would never relinquish. “It was important that we got off to a good start. It was important that we follow our game plan,” Coatie said. “Like we told our kids ‘If we get down, we’re not out. You’ve just got to continue to play both ends of the floor. You’ve got to play together.’ The game of basketball is a game of runs. If they make a run, then our run is going to come. Part of Warsaw’s offensive woes started on the defensive end. With the Tigers packing in a 2-3 zone to keep Central out of the paint, Krebs thought their passiveness on that end of the floor translated to some passive offense early. Warsaw players settled for the outside shot again and again in the first half and converted only 2-of-10 3-pointers, both Kacilyn’s treys in the opening stanza. The Tigers were much more productive during a low-possession second half. Kacilyn’s third 3-pointer of the night on a Ryman reversal at the start of the third period cut Warsaw’s deficit to 16-12. But Coatie opted to pull the ball out on his team’s first possession of the half to force Warsaw backcourters to come out to defend and open up that 2-3 zone. The Blazers burned more than two minutes off the clock before Krebs gave his players the go-ahead to challenge Central’s guards, and the Tigers did a pretty good defensive job in the second half, holding their opponents to only 3-of-11 shooting from the floor. Warsaw converted 7-of-11 shots in the half, meanwhile, but the Blazers capitalized on 12 trips to the foul line with nine makes to hold the Tigers off. Warsaw tied it up twice in the fourth — the first time on Ryman’s 3 at the 5:45 stop of the clock and the second time on sister Maddie Ryman’s 3 from the wing with 4:31 to go — but was never quite able to get out front. Kacilyn Krebs makes a 3-pointer from the wing while Julee Miller boxes out. “That zone kind of gave us a little trouble, so I kind of felt like if we just hold it, hold our composure a little bit, maybe they’ll come out, give us something that we can probably get a good look at. It worked to our advantage for a little bit, kind of slowed us down a little bit so we can re-compose ourselves and get refocused on what we needed to do,” said Coatie of his decision to hold the ball at the start of the second half. Trinitee Harris finished with a team-high 14 points and two steals for Central, while Yiesha Williams collected a near double-double of eight points and 10 rebounds. 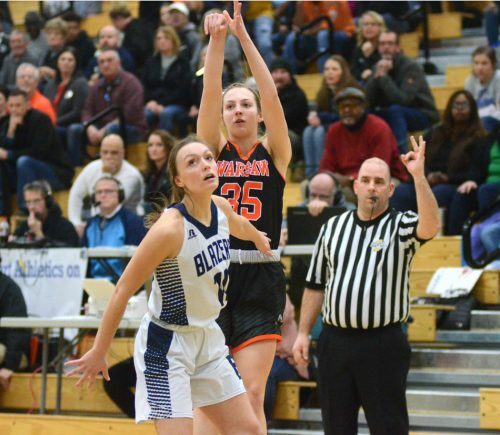 The Blazers (18-6) advanced to Monday’s championship game opposite Plymouth, which won a 37-36 thriller over Concord in the early semifinal Saturday. Warsaw got nine points from Kacilyn, six from Kenzie — who also passed out four assists — and five from Maddie, but the rest of the Tigers lineup was mostly silent. Warsaw closed the season at 15-6 and must say goodbye to Maddie and fellow senior Halle Shipp. “We’ve been through a lot of ups and downs together. Went on a midseason run where we ran off about eight or nine straight wins playing really well. Like any season, you have an injury with Kaylee Patton. We tried to put the pieces back together and regroup, and the thing I can say about this group is they kept after it. Our seniors have been phenomenal. Both of those seniors have been great with their leadership and helping these kids with where we want to go. That was my message at the end — ‘At some point here soon, Warsaw is going to win a championship, and you guys showed us what we need in order to get there,’” said Krebs.